The Tasty Chips Electronics GR-1 is a versatile hardware polyphonic granular synthesizer, boasting 32-bit mixing and intuitive controls. The Tasty Chips GR-1 Granular Synthesizer features 128 grains per voice with 16-voice polyphony for maximum flexibility. 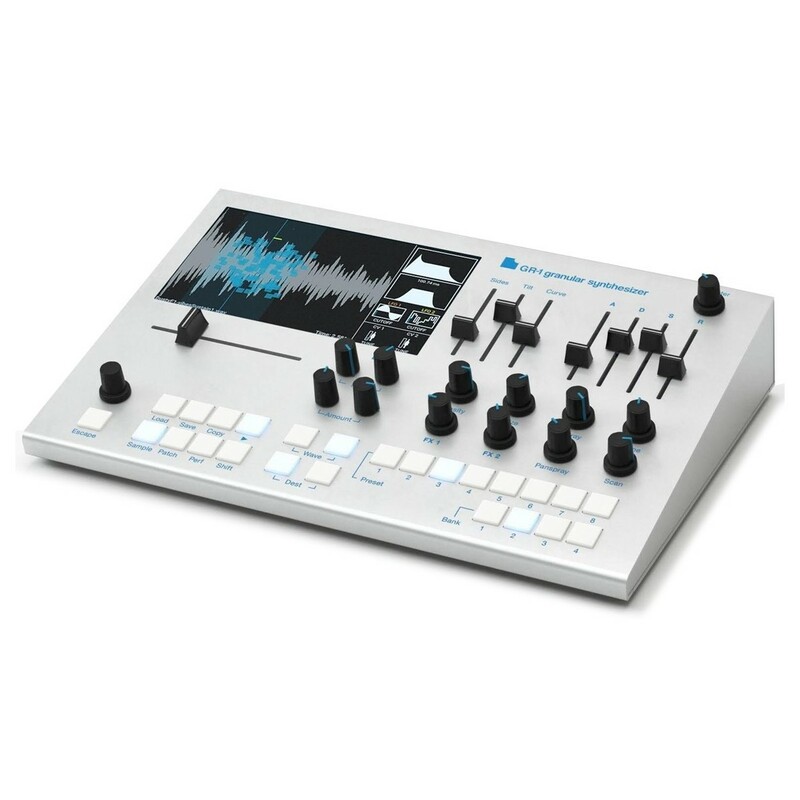 The GR-1 Synthesizer can be used as a standalone unit or in conjunction with computers via the MIDI connectivity. The audio engine provides 32-bit mixing with DAC up to 44.1kHz for optimal audio fidelity. The 800 x 480 pixel, 7-inch TFT true colour display allows you to easily navigate your settings, providing hands-on information for a range of parameters. It also boasts 4GB of internal memory for saving presets and performances. The GR-1 Granular Synthesizer is a hardware-based polyphonic synth designed to create a veritable palette of textures and sounds. It comes complete with an intuitive control section as well as MIDI connectivity and a LED display for monitoring your parameters. The massive polyphonic range boasts 128 grain per voice, complete with 16 voices in total. Combining the 16 voices with the 128 grains gives you 2048 grains in total, allowing you to achieve highly unique sounds. It is ideal for creating everything from textures, soundscapes and pads to leads, basses and more. It also boasts 32-bit mixing and a Hi-Fi stereo DAC for optimal audio fidelity and performance. As well as being great as a compact standalone granular synth, the Tasty Chips Electronics GR-1 also boasts MIDI connectivity. This allows you to use the synthesizer with a range of external devices such as your favourite DAW and MIDI-compatible musical devices. It can be used with a variety of USB/DIN MIDI keyboard, USB sticks/flash drives, audio interface and even your PC keyboard. Additionally, it also features CV connectivity for use with Eurorack modules and full modular systems. At the heart of the GR1 is 2 assignable LFOs with waveforms and direct controls. The waveforms included are: Sine, Random, Saw and Square. It also features a 12dB/octave digital lowpass filter with integrated and MIDI controls. There are also a range of precision faders for changing the ADSR amplitude and Grain window. Rotary encoders are included for configuring parameters, as well as file and sample selection. The configuration menus provide added possibilities for your pots and sliders. All of the integrated faders, knobs and internal controls are controllable via MIDI CC, with full support for program change and pitch bend. Designed to be an all-in-one granular synth, the GR-1 also boasts a massive 4GB of internal memory. The internal memory can be used to save and store performances and presets. You can also expand your memory via external USB drives such as flash drives for added flexibility. You can use your USB memory stick to upload sample files in various formats, allowing you to use the samples as a base to create your own unique sounds. The compact yet robust design makes it ideal for use on desktops and other flat surfaces. The compact design also makes it highly portable, ensuring you can take your synth with you on the move with ease. It boasts a wide range of connectivity including MIDI IN and MIDI Thru with DIN and USB MIDI. Also included is a high-quality headphone amplifier with dedicated volume control for private monitoring. The 800 x 480 pixel, 7-inch TFT true colour display provides all the information you need for the various parameters, controls and settings. The configuration screen allows you to access many more options for your controls for added versatility. It also features dual CV assignable inputs with voltage protection and a single gate output. The robust aluminium casing also provides optimal durability, ensuring a long-life span. Much more to be added by firmware updates: fully exposed mod matrix, another mode of granular synthesis (very small sample loops), MIDI clock sync, LFO cross mod, sampling via USB, extra FX types, and sub-sine (tuning )oscillator.